Sourwood. 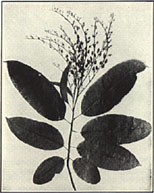 Oxydendrum arboreum (L.) DC. Sorrel tree, sour gum, elk tree. Sourwood is found in woods, Pennsylvania to Indiana and Alabama and Florida. This is a smooth-barked tree reaching a maximum height of 60 feet with a trunk 15 inches in diameter. The pointed oblong or elliptic, finely and sharply toothed leaves are from 4 to 6 inches long and 1 to 3 inches wide. The small, white, waxlike flowers, produced in June and July, are borne in long, slender, 1-sided, clustered racemes. The reddish-brown wood is hard and heavy. prev: Snakeroot. (1) Aristolochia serpentaria L.; (2) A. reticulata Nutt. next: Spearmint. Mentha spicata L.